A few months back I realised that I had been seduced by the glamour of the leadership and unwittingly bought in to a competitive, mass myth creation process: what is leadership? find the ‘answer’ to leadership, find the ‘answer’ to … life? Despite knowing the extent of its cultural bias (Nesbitt, 2003) had I also become a victim of the Fundamental/ Leadership Attribution Error (Hackman, 2002), mistakenly placing leaders at cause for life’s highs and lows? And I am not alone – it seems a great deal of the professional and academic worlds are happily wallowing in this seduction too. So what is leadership? I’ve come to the conclusion it’s not the question that is wrong. What might be ‘wrong’ (or just less useful, albeit lucrative) is spending a great deal of time actively pursuing the ‘solution’, the one truth to rule them all. The act of questioning, the problematisation of leadership, is where the potentiality lays. That is to say, the quiet holding of the slippery undefinedness of leadership as something that we don’t fully understand. This invites us to keep questioning and exploring, this has usefulness in the generative process of becoming, of ‘development’. Being comfortable staying with the uncomfortableness of the not-knowing and not abandoning the problem nor entering the goal-driven race to solution (and subsequent dereliction of the very-thing-we-were-seeking to ‘the past’ and to acceptance): this has energy and potentiality. Simpson, French & Harvey’s (2002) extrapolation of Keat’s ‘negative capabilities’ into a leadership practice they call ‘reflexive inaction’ explicitly discusses the ability to stay in the discomfort of unknowing i.e. holding with a problem. Grint’s 2005 paper, whilst making no mention of Simpson et al’s model, also asserts that leadership that ‘’is often constituted as indecisiveness” may be the most appropriate response to complex, ‘intractable’ ‘Wicked’ problems. He claims that such ‘Wicked’ problems require leadership that stays with the problem, that respects there may be no solution as such, but that movement to ‘better’ is possible and is likely to come through drawing multiple sources of expertise into a problematized space and purposely holding with the problem in an aroma of creativity and innovation. My proposition is that both creation and holding of a space that is ‘safe’ (contained) and the ability to bring people to and hold them in a process of problematisation (in that space) are practices of leadership, and that such practices are highly relevant, if not essential, to leadership in our volatile, unstable, complex and ambiguous world of increasingly Wicked problems (Chaffer, J 2017 blog). There is therefore an imperative to understand how to develop such practices for the betterment of leadership. At a loss for a name I have (temporarily) called the combination of processes of problematisation and psychological safety containment. The placing of containment sous rature (under erasure, from Heidegger), signifies the problematisation inherent in the word and also in my attempt so far to grasp and articulate this state or process. Of note: Heidegger also intended the sous rature to represent both presence and absence in the text. Thus the sous rature also keeps in the mind the underpinning approach of this study: the dialectic and/ both positions found for example, in the Tao, the Vedic tradition, Jain’ Syādvāda, Nagarjuna’s middle way (all of which, by the way, also guide us to question everything, even their own existence) and also Western epistemologies. Critical Leadership Studies, as noted above, takes a critical approach to hegemonic, essentialist leadership and leader studies. It’s founded in a “concern to examine leadership power dynamics” (Collinson, 2011, p181.) and goes about this with a diverse array of approaches and “an eclectic set of premises, frameworks and ideas” (ibid.). As discussed above leadership-CLS seem to have become a little stuck in their co-dependent positions, however CLS has also produced some useful and interesting perspectives. In 2013 Keith Grint introduced a typology of leadership: ‘Leadership as….. Position, Person, Results and Process. Later Brad Jackson (2017, amended the Results to Performance and reconfigured the idea from typology to a set of lenses with which to interrogate leadership. He also added Purpose (also purposefulness) and, drawing from human geography and Maori traditions, Place. Place represents location, locale, sense of place (after Agnew, 1987 in Jackson, 2017). I would also add group field, shared space (e.g. ba 場)and echoes of what came before (cynefin in Welsh, turangawaewae in Maori). I’ve used the ’P’s to enable useful questioning and the holding open of a critical, enquiring mind-set around leadership and leadership development: they provide a framework for the problematized space. It is a gateway into different ways of thinking around leadership – to open up thinking, to add flavour. I’ve taken the liberty of adding three other lenses: Power (power dynamics) as a fundamental critiquing point whatever the epistemology/ ontology; Practice – what we do, how we bring others with us, as a consistent approach founded in artfulness, attributes and attitudes and, lastly, Problematisation – potentially also a fundamental, a base approach to all the other leadership ‘P’s. 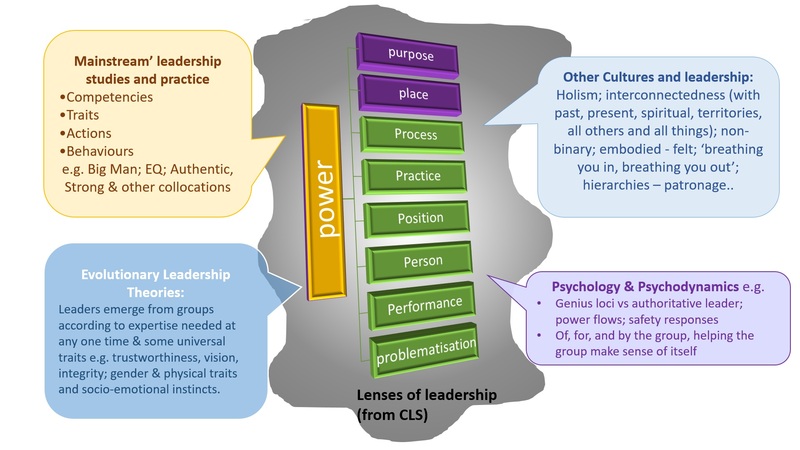 This is visualised in the diagram below, aiming to show how I see evolutionary processes, other cultures ways-of-being, psychology, leadership and other Western schools connecting around the leadership problem. 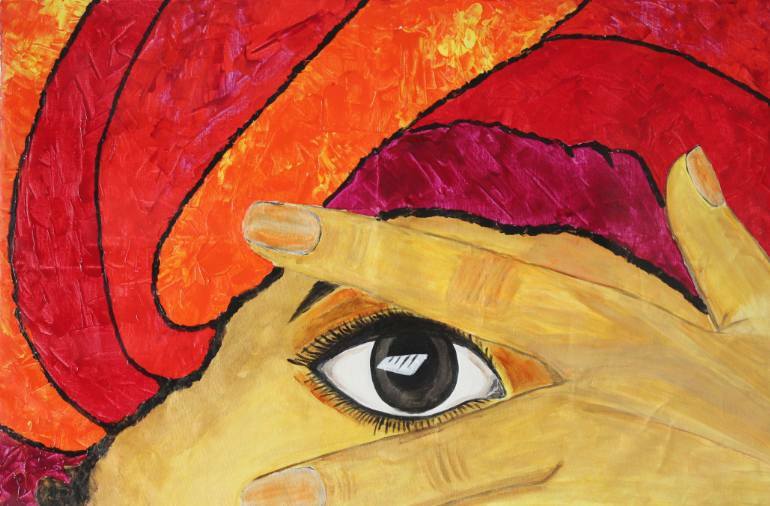 For my work the ‘P’ gateway helps maintain the and/both perspective – it encourages a focus on similarities between the epistemologies, ontologies and possibly also methodological approach. If nothing else it provides an accessible bridging language between the various lenses and fields.